The volume and velocity of the oil gushing from the BP oil pipe in the Gulf of Mexico is something that both government officials and BP executives are underestimating. In fact, and something that people may have forgot, but when the BP oil rig blew up and the oil pipe broke, the initial estimates were that the oil pipe was gushing only 1000 barrels of oil a day. Today, the estimates by BP and government officials place the volume of gushing oil upwards of 25,000 barrels a day. With that level of volume and velocity of oil spewing from the busted well, Adm. Thad W. Allen, the Coast Guard commander in charge of the government relief efforts, sees the clean up effort of the Gulf of Mexico stretching well into fall of 2010. BP officials have even underestimated the intensity of the oil gushing from the well even as early as today as they attempt to control the containment seal valves. It has become an intricate balance of engineering and timing to prevent another failed attempt at controlling the gushing oil. It’s hard to imagine 25,000 barrels of oil a day rushing into the Gulf of Mexico. All of that oil just continuing to fill the Gulf is very discouraging. At this point all of the effort and focus from both BP and the government needs to be on stopping that pipe from gushing oil – period. Not only is the cleanup of the gulf unprecedented, but all of the industries along the coast are going to be impacted much beyond just the fall of 2010. Nice website, jackasses… Spam it up.. The link above will infect your computer with a virus.!! What if the amount of oil was more like 350,000 barrels a day!? If we are kept from the truth, we wouldn't understand why BP and our government are doing what they are doing, or not doing. I don't trust anybody from BP or the government. When have they not lied? All life and good health on our shores, our land and that of the world may well be in jeopardy due to the people involved in this catastrophic disaster perpetrated on innocent human life and the natural world. hes right dont click on that link its a koobface virus or the facebook virus…. The link you are referring to above is not spam – Joe! No it won't. Just went to it and virus checked. You are only saying it is a virus because you work for BP or support them and do not want people to come up with better ideas. Oil clean up will last into the next generation and the generation after that if you take into account the diseases and loss of life, the loss of natural habitat for millions of unsuspecting creatures who are at the foundation of life for man. it can STOP up to 100% of the oil leak in a matter days!!! I sit here and watch the feed from the oil leak and it does shock me that we can fly people to the moon and back but we can’t seem to stop this leak. And how everyone is playing the blame game, it is what it is a tragic accident and I feel very bad for the sea life and the poor birds but drilling is something we cannot live without. 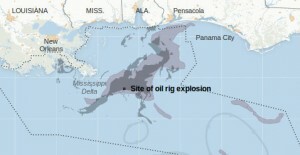 And for as much drilling we have done in the gulf it looks like a pretty safe operation to me. They are calling this the biggest leak in US history,But look at these the world has recovered from. Iraqi forces opened the valves of several oil tankers in order to slow the invasion of American troops. The oil slick was four inches thick and covered 4000 square miles of ocean. An accident in an oil well caused an explosion which then caused the well to collapse. spilling 30,000 gallons a day into the ocean for a full year. Trinidad – 1979 – 90 million gal During a tropical storm off the coast of Trinidad and Tobago, a Greek oil tanker collided with another ship. A broken pipeline in Russia leaked for eight months before it was noticed and repaired. A tanker collided with a drilling platform which, eventually, collapsed into the sea. The well continued to spill oil into the ocean for seven months before it was repaired. A tanker cought fire and was abandoned before sinking off the coast of Saldanha Bay. France – 1978 – 69 million gallons A ship ran aground and leaked into the English Channel. The tanker exploded and sank off the coast of Italy and continued leaking it’s oil into the ocean for 12 years. Nice website… No SPAM… Some creative ideas for sure! but there is a problem with the link posted above? There's MILLIIONS OF IDEAS and they only tried 3 ??? ?